This 1934 photo was taken at the ranch home of Alfred Hanson near Cle Elum, Washington. Pictured from left to right, Shorty Richards, Russell Hair, Langridge Shelton, Bill Rozinski, Joe Rozinski, and George Bettas (the author's father). Trophy pictures showing hunters with game they have taken have been the primary means of recording hunting successes since the advent of cameras. Early photographs of game trophies were often taken after the trophies were removed from the field because not many people had cameras, and the cameras of the day were difficult to take afield. Many of these photographs were taken at a place where a camera was available such as at a hunting camp or at the home of one of the hunters. Early photographs were composed with the animals the hunters had taken laid out on the ground, hung on a meat pole, or displayed on the vehicles used to transport the game from the field. The 1934 photograph shown is typical of the trophy photographs of that era. This photograph was taken at the ranch home of one of the members of the hunting party who owned a camera and includes my father. 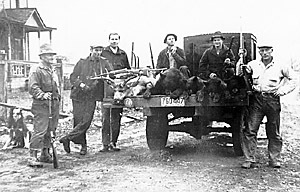 This hunt took place in the Teanaway area of Washington. The neighbor's dog even got in the photograph. Such photographs were the norm 60 years ago and served the purpose of recording the hunt. Since that time, societal values and sensitivities have changed dramatically. Many practices of the past are no longer considered to be in good taste. Just as the practice of transporting big game animals on the fender of a vehicle is no longer considered appropriate, the publication of trophy photographs which do not display the animal in a discreet and respectful way is no longer acceptable. As ethical hunters, we need to be sensitive to the image we communicate to other hunters and to the non-hunting public. 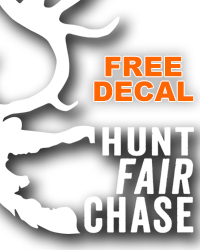 In spite of all that has been done in the area of hunter ethics, big game animals continue to be photographed on or in the back of vehicles, hanging in garages, or lying in a heap on the ground with little thought being given to composing the photograph and displaying the animal properly. Photographs such as these are the result of the hunter not having a camera while afield and little thought being given to how the photo is composed. Even when it is not possible to photograph a big game animal in the field, discrete photographs may be taken in one's backyard or some other natural area. Interestingly enough, some of the field photographs submitted with trophy entries to the Boone and Crockett Club's Awards Program show little regard for the animal or the composition of the photograph. These photographs serve the purpose of recording the animal's size, antler configuration and other features, but are not suitable for publishing in Boone and Crockett Club publications. It is the editorial policy of the Club to only publish field photographs of big game animals which present the animal in a discreet and respectful way. 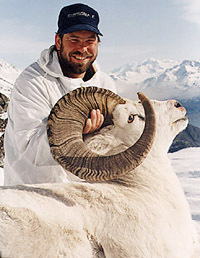 B&C Associate, Kenny Meinzer's Dall's ram scores 170-7/8 points. The first thing one needs to take good field photographs of trophy animals is a camera at the scene of the kill. Today's cameras are technological wonders and there is a wide variety of light, compact cameras that will do the job. My favorite camera is an Olympus XA. This little camera fits into my shirt pocket and literally goes everywhere I go while hunting. It has been with me on backpack hunts from the peaks of the Alaska range and the tundra of the Alaska Peninsula to the mountains of Wyoming and the breaks of the Snake River in Idaho's Hell's Canyon. Through the years it has performed flawlessly. What makes it so great? It is lightweight, has an excellent glass lens, is mechanically reliable and has a foolproof self-timer, which is especially important if you take an animal and your partner is on the opposite ridge. Some of my very best photos of trophy animals are those I have taken with a self-timer. Since big game animal are most attractive early in the morning and later in the afternoon, light is a consideration when taking photographs. The best photos are generally taken in bright, warm sunlight. Most modern films work fine under these circumstances. When you are photographing early in the morning or late in the afternoon, you need a film with an ASA that will do the job for you. I like to use 100 ASA color slide or print film since it is fast enough for most light conditions and has a fine enough grain to be enlarged up to and including 20 x 24 inch poster prints. The issue of color slides or prints is one we could argue for some time. I take both kinds of color film. I use the slides for recording the hunting trip and shoot both slides and color prints when taking trophy photographs. I also carry one roll of high-speed black and white film just in case I need it for marginal light conditions or special effects. When one considers the cost of the hunt, the cost of a few extra rolls of film is negligible. I always take several extra rolls of film and take lots of pictures, especially when taking field photographs. I use different camera angles and light settings looking for that one perfect photo. The first thing I do when taking a trophy photo is to look over the area where I have taken the animal and mentally compose the photograph. Consider the background and make use of the natural beauty of the area whenever possible. Then situate the animal so you can take advantage of the natural background to the greatest extent possible. Sometimes you will not be able to move the animal due to its size or the terrain. In such cases, you will have to do your best and go with what you have. Set the animal up so it is presented in a respectful way. Tongues hanging out, blood on the animal or the ground, bullet holes showing in the body and legs askew detract from the photograph and contribute to distasteful photographs. Place the animals' legs up under the body and set it up so it looks as natural as possible. Wipe off any blood that may be present. I always carry five or six squares of paper towel in my hunting pack for this purpose. 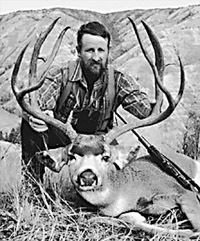 B&C Associate Pat Sinclair's typical mule deer scores 195-2/8 points. 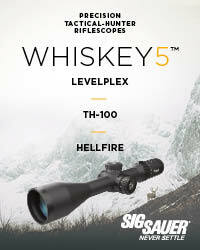 Check to be sure your rifle or bow is pointed in a safe direction if it is to be included in the picture. Be sure that hunting gear such as ropes, knives and lunch sacks that will detract from the photo are not in the photo. If you are unable to take the photo while in the field check to be sure that the area where you are taking the photo is as natural as possible and does not include items that will detract from the overall quality of the photo or the animal being photographed. 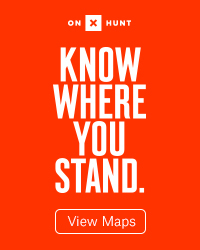 Get up as close as possible and look the situation over through your viewfinder. The closer you get, the better the animal will look. Look for anything distracting around the edges. Remove limbs, brush, or grass that are in the way. Check the sun angle and the need to compensate for back lighting. Frame the scene and check all four edges of the photo so that you do not cut anything out. Finally focus the camera and shoot. It is a good idea to take several photographs from several angles and use different parts of the scene as the point of focus. If you have an autofocus camera, be mindful of what the camera is focusing on. If your depth of field is short and you focus on the nose of an animal, such as an elk, the hunter may be out of focus. If you focus on the hunter, the animal may be out of focus. When in doubt take lots of photos. I like to take trophy photographs from a very low angle and use the sky or the background to frame the photograph. The animal will show up better when you do this. When I'm alone I use a small, lightweight tripod and set the camera on the tripod on the ground. My favorite tripod is one sold by Recreational Equipment Company in Seattle, Washington. It is made of high-impact plastic, weighs a few ounces, folds up nicely and has a velcro strip for attaching the tripod to a limb, bush, or backpack. This tripod will double as a support for a spotting scope. If I do not have a tripod, I set the camera on a rock, piece of wood, or whatever is handy. The final point in taking a good trophy photograph is to not hurry. Take your time and attend to every detail. This is your best, and sometimes only, opportunity to take a great photograph and record a special moment.